You may have heard about the Brain-Cave Festival, a local music festival going on next weekend in Greenpoint. The third iteration of the four-day rock fest, which features a plethora of indie bands, will take place next Thursday April 11 - Sunday April 14th at Europa. On the bill are some of our neighborhood favorites, like Monogold, Eula, Backwords, and Quiet Loudly, joined by headliners like NYC-via-Japan's Peelander Z and San Francisco's Lemonade. 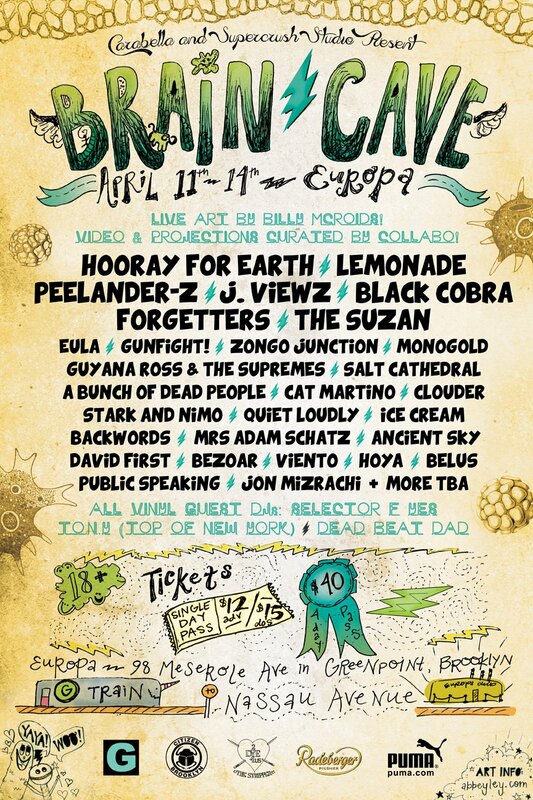 But, beyond the incredible bands that are playing, what exactly is "Brain-Cave"? We gained some insight into the indie festival from co-producer Gabo Rodriguez and founder Luis Velasquez who dished on the history of the fest, their collaboration with blog Greenpointers, and some surprises the fest has in store - including live art, free swag, and a nightly open bar! Bushwick Daily: So, what exactly is Brain-Cave? Where did that name come from? Gabo Rodriguez: Brain-Cave Festival 2013 is a Brooklyn music festival founded by CaraBella Presents in 2011, at Shea Stadium. Its mission has always been to feature the brightest and most innovative bands that the borough’s underground/indie music scene has to offer. From its humble beginnings, it has blossomed into a four-day multimedia bonanza. Luis Velasquez: Brain-cave is a festival started by Luis velazquez A.K.A Cara Bella & Justin Stivers( Former member of the Antlers) back in April 2011 to pay homage to all artists from all mediums that represent the culture and Beauty of Brooklyn. The name came from the diverse and versatile genres we chose to show case- A meeting of creative minds that come together to support our fellow artists that make up our Brooklyn Community- hence Brain-Cave was born. BD: You showcase a variety of bands, from Japanese Punk band Peelander Z to folk rockers Quiet Loudly. What's your aim with booking such diverse genres? GR: Both of us have said that this festival is very personal in many ways. We're both connected to all the bands, either as fans or as friends. Our main goal is to give show-goers, the opportunity to see and hear all the diversity this city has to offer. At the same time, we want to challenge them to experience styles they've never experienced and listen to groups they've never listened to, playing with groups that are a bit more established in the music scene. LV: Our aim is to showcase creative like minded people, have all of them hang out and appreciate each other and be opened minded to the fact that the music is universal and should be used as a connector to better the world.It's awesome to be working with people that care about the music- Gabo rodiguez Is a true gentleman that has opened a whole new way of my creative process. BD: Brain Cave originally happened at Shea Stadium in Bushwick. Last year it changed its location to The Bell House in Gowanus, and this year it takes place at Europa in Greenpoint. How come you switched venues over the years and why'd you choose Europa as your festival site this year? GR: The idea of making Brain-Cave Festival a nomadic festival started off randomly. Luis and I started throwing ideas of where the festival should be this year; we had many places in mind. But then we decided on picking a different neighborhood as the last ones because we thought that, similar to genres, every neighborhood has its own diverse culture and feeling. We wanted to bring Brain-Cave to a neighborhood it hadn't been before. We chose Europa, because it's a neighborhood staple! It's been around for a number of years, as a local venue, and we wanted to keep things local. BD: One of our fave blogs, Greenpointers, is a partner of the fest. What's all this about the Greenpointers.com Market? GR: Greenpointers has been our partner in many events in the past - from CMJ Showcases to Sandy Benefits. We wanted to bring them on board for this festival because it made sense, seeing that we were in their turf! Hehe. The Greenpointers.com Market is a very successful market they've been hosting the last couple of months. We thought it would be ideal to bring a little bit of the Brain-Cave Festival to the Market. That's why we're having artists perform there this time around! LV: Greenpointers are always doing beautiful things! I love the peeps behind it- so why not partner up with peeps we support! The market always brings out alot of fun individuals- so we wanted to showcase some great music while you chill and relax on a saturday afternoon and than walk over to Europa and rage it up with us and live it up Brain-Cave Style!! BD: You promise "Many Surprises" on your event page. Any hint of what one might be?! GR: We just announced that Forgetters (ex members of Jawbreaker, Jets to Brazil, Against Me!, etc.) and Monogold are playing! If you go by those standards, you can imagine what else we can dish-out! LV: Let's just say that inspiration will be made/ fun will be had & Love will be shown!! Peace,love and Respect! The Brain-cave Crew! 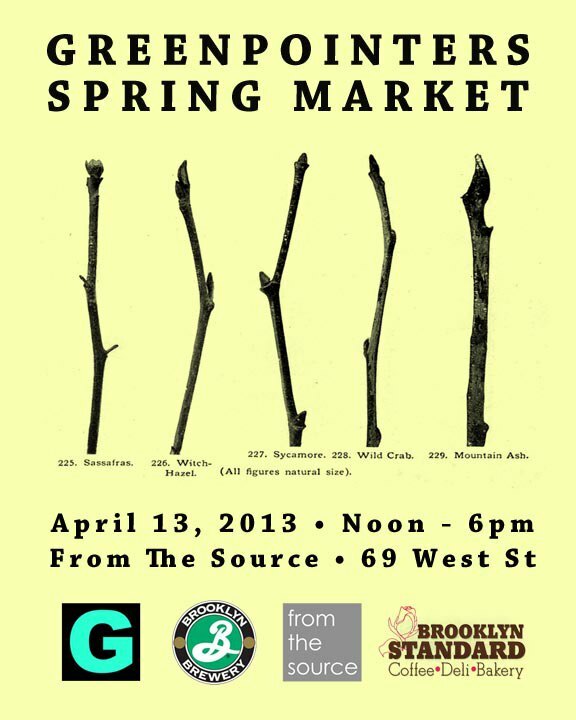 Saturday, April 13th - Greenpointers.com Market - Doors @ 12:00PM- Show @ 1:00PM – FREE!